The transformation of a 60’s 2-bed bungalow into a contemporary 5-bed property with no need for planning permission. 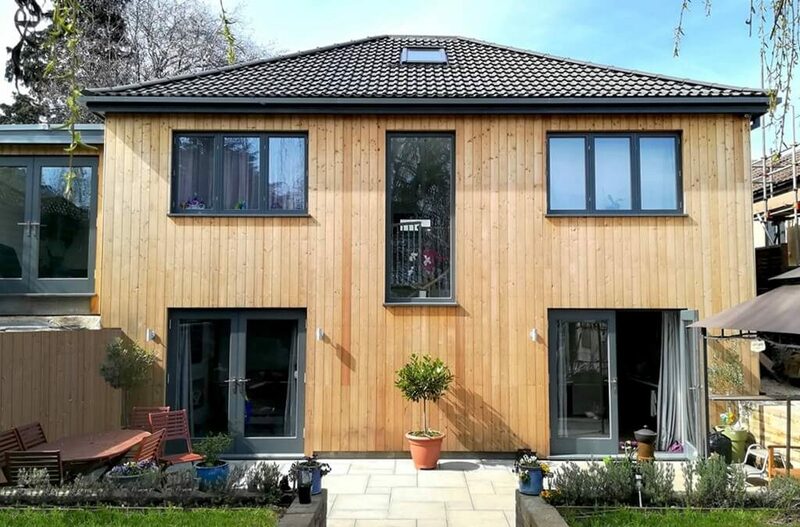 One of our most exciting projects to date has been the transformation of a compact two-bedroom bungalow into a stylish five-bedroom family home in Bristol. What started as a MOSSpod extension project developed into a complete remodeling of the entire house with garden landscaping, interior design and a garden room. And all, unbelievably, without needing planning permission! The family have been utterly delighted with the results and we’re continuing with more projects for them. It all began with the age-old problem of feeling cramped and claustrophobic in a home that was too snug for the number of occupants. The couple living here own their own business, so they were both yearning for extra space to work from home; space that could be quiet, peaceful and productive. They also wanted to make sure their two young girls had the room they need to develop and explore. The project started with us looking at how we might extend the side of the bungalow with a garden room and home office to provide them with extra room. But after seeing our initial designs, the family were thrilled with the look of the pod extension and decided they wanted the entire house remodeled to match! We re-designed the entire internal space, adding three extra bedrooms and even digging into the ground at garden level to create the main open-plan living area out of cellar store rooms. The result is a fresh, spacious, practical set of living spaces. The MOSSpod extension became a hybrid of our River Range and our Park Range MOSSpods, melding the two designs together in a flexible way. The family love the materials we use for the MOSSpods and so we carried these across the whole house. The warm, caramel-coloured larch cladding has freshened up the rear of the property and contrasts beautifully with the charcoal grey of the new timber windows and doors. Over time this will silver and bring a whole new richness and warmth with aging. The front of the property has been given a face-lift with bright, clean lines of white render and new dark grey windows. We used our usual galvanised industrial style fittings and fixtures throughout, uniting the interior and exterior. The kitchen design reflects the grey hues of the pod materials and exterior, as well as introducing beautiful ivory-white quartz surfaces adding a silky texture and contrasting colour. We particularly love the oversized filament lights, bringing an elegant, modern finish to the space. We have been privileged enough to be able to landscape the back garden of this property as well, fully synthesising the design. This is an ongoing project in which we are creating a sunken patio with a rich living Green wall with herbs for the kitchen and alpines for colour, incorporating our favoured larch within the design. Excitement is now growing for developing the front garden and extending the scheme even further. Our clients even loved our Micro and Mini MOSSpods! After seeing the glamping pods, they couldn’t resist having their own garden room installed at the end of the garden as a home gym. The effect is stunning: it ties the design of the whole property together with the velvety larch framed by the deep grey, agricultural-style metal cladding. It faces the rear exterior of the house, providing a delightful outlook and it beautifully echoes the house, creating this sense of unity and harmony. The family also loves it because drawing the living space outside makes sure the bottom of the garden doesn’t become overgrown and neglected. Our clients have really thought about how they want to enjoy their garden space and we were thrilled when they asked for a MOSS potting shed and tool store in the same materials to accompany their vegetable patch. It just keeps growing! It has been quite a journey and we’re so excited to see the whole project come together once the front garden and potting shed are complete: it is a true MOSS Design transformation. If you are pondering the up-lift of your own property or have your eye on a new house to renovate and extend then we’d love to help. Give us a call in our Bristol office to chat about your ideas. Find all our details on the contact page of the website.